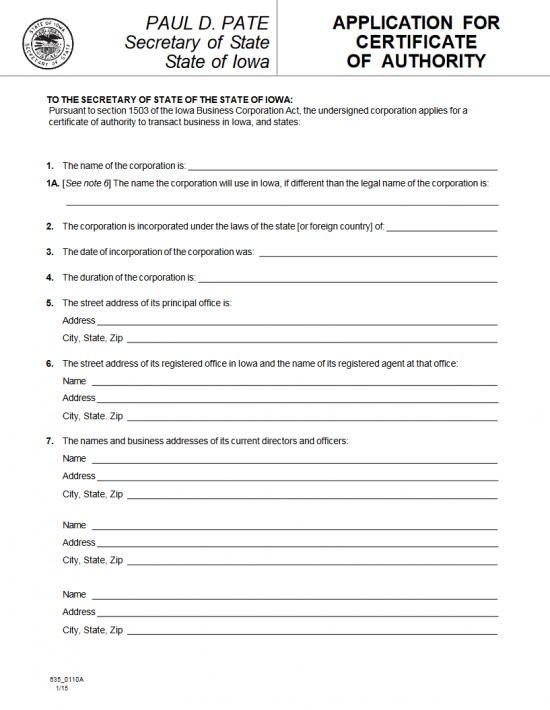 The Iowa Application for Certificate of Authority| Form 635_0110A is a required form which foreign corporations must be complete then submitted to the satisfaction of the Iowa Secretary of State prior to operating as such in this state. This form is a standard form representing the basic topics which must be discussed meaning that other filings or documents may be necessary depending on a foreign corporation’s circumstances or entity type. Generally, Incorporators should do as much research as possible, including seeking consultations with appropriate professionals. It is worth noting that every corporation must submit a Certificate of Existence or Certificate of Good Standing issued by its home state’s governing body and issued within ninety days of the application date. 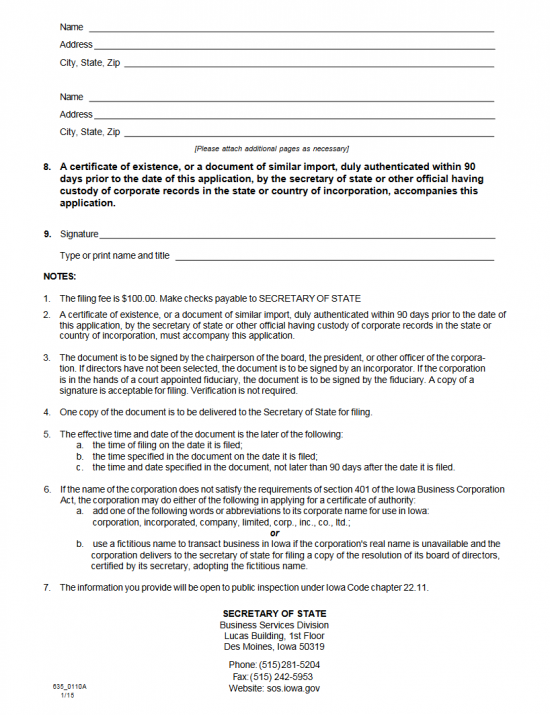 The Iowa Application for Certificate of Authority For-Profit Corporation be should submitted simultaneously with any required documents and a full payment of the $100.00 Filing Fee. You may either submit by mail to Secretary of State, First Floor, Lucas Building,321 E. 12th St.,Des Moines, IA 50319 and remit payment with a check in this amount made payable to “Secretary of State” or you may upload the document on the website, https://sos.iowa.gov/file/origination/index.aspx, and pay with a major credit card (Visa, MasterCard, Discover). Step 1 - Download the Iowa Application for Certificate of Authority by either clicking the “Download Application” link or selecting clicking here: Form 635_0110A. You may save this as a PDF file then either edit it with an appropriate PDF editing program or you may print it then type in the information. Step 2 - The first item requiring attention, Item 1. Report the Full Name of the foreign profit corporation as it is documented on the Certificate of Existence being submitted with this application in Item 1a. In some cases, the foreign corporation may be prohibited from using its Name in this state. When this happens the foreign corporation must submit a Resolution from its Board of Directors adopting a Fictitious Name to operate under in the State of Iowa. This resolution must be certified by the Secretary and the Fictitious Name reported in Item 1b. Step 3 - In Item 2, report the Name of the Jurisdiction this corporation is in. That is, what State, Province, or Country’s laws does it answer it. Step 4 - Item 3 requires the Date of Incorporation for the foreign corporation, in its home state, to be entered on the blank space provided. Step 5 - Item 4 must have the lifespan of this corporation defined on the blank space provided. You may either enter the word “Perpetual” to indicate this corporation shall operate without a solidified date of termination or you may enter the set Termination Date of this entity’s corporate entities. Step 6 - In Item 5 enter the Street Address of Principal Office’s physical location on the first blank line. On the next blank line, enter the City, State, and Zip Code of the Principal Office’s physical location. Step 7 - Item 7 requires a clear list of all the Directors and Officers that are considered current and active in this corporation’s structure. There is enough room to list five entries (each party having its own entry) however if there are more than five they must be reported in a separate document that is clearly labeled then attached. Each entry should consist of the Full Name and Full Address of a Director or Officer. Step 9 - Item 8 obligates the submitter of this application to include a Certificate of Existence issued by the foreign corporation’s Secretary of State (or other comparable governing entity) within the past ninety days with this application. Step 10 - An authorized Officer or Representative must Sign his or her Name to this application on the Signature Line below Item 8. Below this the Signature Party must Print his/her Name then report his or her Title. Step 11 - Once you have obtained all required documents for this filing and have filled out the Iowa Application for Certificate of Authority| Form 635_0110A in its entirety you may submit the application for approval. You must pay the $100.00 Filing Fee when submitting this application. You may pay this with a check made out to Secretary of State if you are mailing in the documents or, if sending them as a PDF through the Iowa Secretary of State’s website, you may pay with your account or major credit card (Visa, MasterCard, Discover).